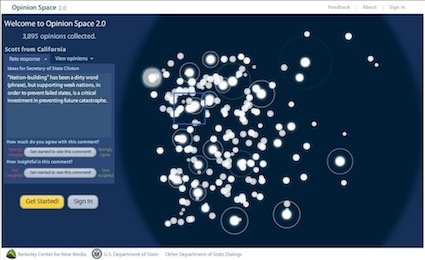 In a stunning new demonstration of how the web combined with visualisation can contribute to the involvement of citizens in governance, the US State Department along with University of California at Berkeley’s Center for New Media (BCNM) has launched Opinion Space. Even if we don’t buy in to the submission that all participants who choose to respond are somehow on a level playing field, at the very least, tools like this showcase an administration’s willingness to publicly display global reactions to pressing questions that may be anchored to US foreign policy, but because of its influence, impacts more than just US citizens. Opinion Space runs on Flash, and is obviously based on some interesting backend wizardry. Open sourcing this tool would be the next logical step, so as to make this technology useful for a greater audience and set of purposes. 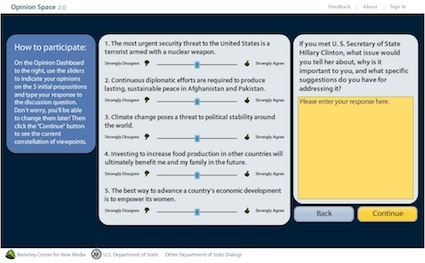 Currently, the system is based around 5 key questions, and another on what you would post to Secretary of State Hillary Clinton should you meet her. Anyone can answer the questions, but to vote on others, you need to register. I find this extremely interesting because I have just launched on Groundviews, using Google Moderator, a similar experiment to capture new idea to strengthen Sri Lanka’s democratic governance post-war. Opinion Space makes interactions on pressing foreign policy and global issues fun. It’s visualisation isn’t complicated, and pulls you into read and rate the responses of others. A way to embed this visualisation on other sites, link to specific responses, track the growth of opinions over time and as noted earlier, the launch of an open source version of this tool would be really welcome in the near future, especially from my interest in using tools like this for peacebuilding and reconciliation. Also interesting would be studies on how the launch and use of tools like these shape perceptions towards global issues and US responses to them – does the feeling of participation and the visualisation of representative opinions count for stronger support of US policies, or does it over time lead to more disenchantment?